- Peel Papaya and cut off top and tail. Cut into thick, even sized rings and carefully scoop out seeds from the centre of the rings. Place on plate. - Mix ingredients for Salsa in a bowl and set aside. - For the Guacamole, place all the ingredients together in a bowl and mix well, mashing the Avocado until a few chunks remain. Taste, and adjust seasonings. 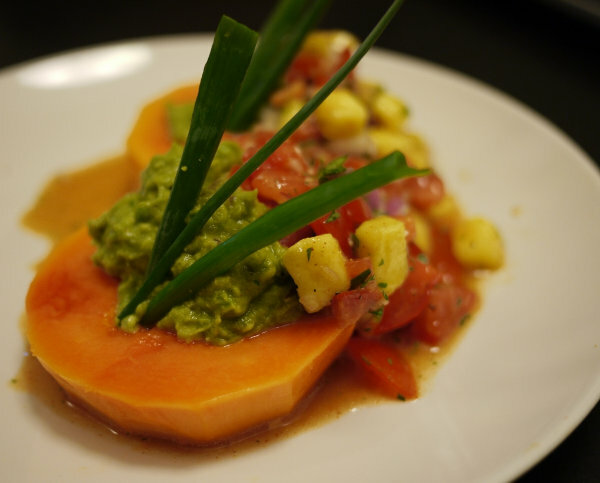 - Scoop a large spoonful of Guacamole onto each Papaya ring, followed by a spoonful of Salsa. Decorate with Spring Onion if desired. -Eat with a knife & fork, and enjoy! Don't use Papaya that is too ripe, as it won't keep its shape! View and submit recipes at the No Meat Zone. Rebecca is the author of Blissfully Vegan. She currently lives in Hong Kong where she works as a model and is obtaining her Masters in Holistic Nutrition through an online program.